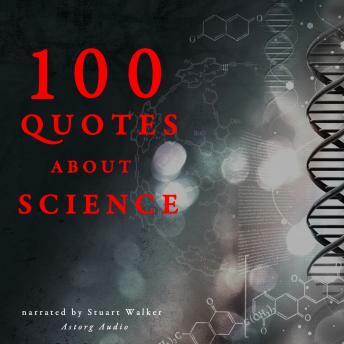 We have selected for you 100 great quotes about science. The education of the people is a great wealth. Learning science and create our future through knowledge and science are great challenges for the nation. It will open the horizons of a glorious future. Our audiobook will help you to think, to analyze, to boost your creativity, using science, knowledge, by listening and thinking about those very appropriate quotes. Take some time to analyze and think about what those great minds will tell you about science. A great quote is very similar to a great thinking and a small poem. It can encapsulate a large web of ideas, thoughts, reflections, emotions in a few words. The reader of a great quote is forced to think about what he just heard. He has to think about those words and what they mean. An excellent quote requires the reader to pause to contemplate the real meaning and poesy of a few words. A great thought reaches a level of universality. Quotes hit hard into the essence of being human. The right quote can help us to see some invisible meanings of things or subjects. The range of authors of those 100 quotes to boost your self esteem is very large: from Nikola Tesla to Albert Einstein, from Isaac Asimov to Stephen Hawking, Isaac Newton, Charles Darwin, from Jules Verne to Thomas A. Edison, Adam Smith, Leonardo da Vinci and many more. Take advantage of the knowledge and the intelligence of all those men and women !